The roots of your faith will come to life on this extraordinary journey through the Holy Land. Follow in the footsteps of Jesus as you learn more about his life and ministry. To stand in the very places where history unfolded is a true highlight as you visit sites of biblical importance. 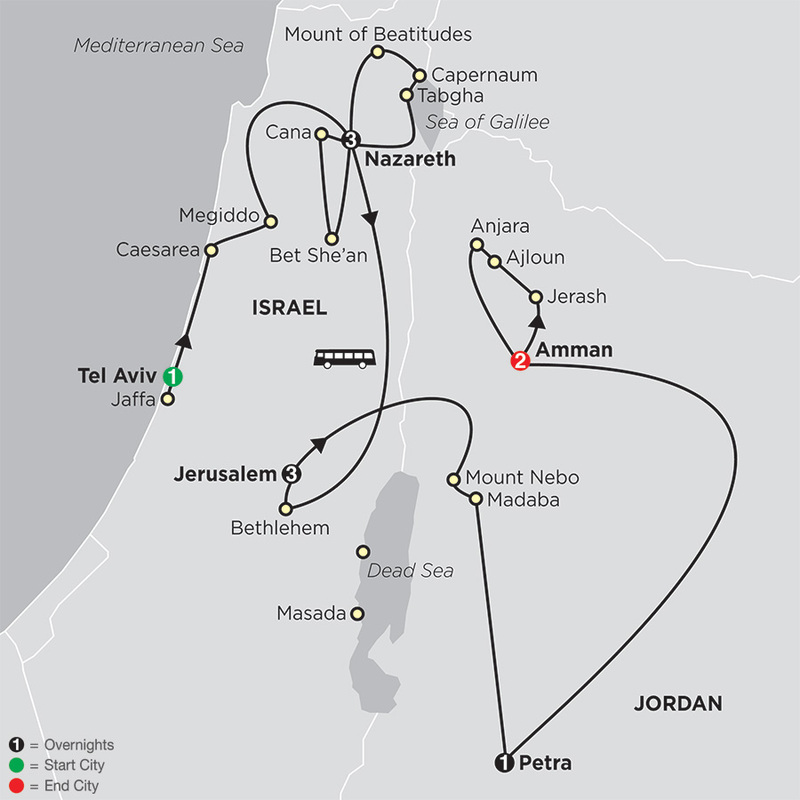 Bethlehem, Nazareth, Cana, the Sea of Galilee, the Mount of Beatitudes, the river Jordan, as well as Mount Nebo in and Bethany Beyond the Jordan are only some of the sites you will experience to reignite your faith... All of this—and much more—await you on this Israel and Jordan tour designed for value-minded travelers. Headsets throughout the tour except Jordan. Welcome to Israel! Check into your hotel and enjoy the rest of the day at leisure. This evening, meet your Tour Director and fellow travelers. Enjoy a full day exploring some of the Holy Land’s ancient biblical and modern sights. Begin by driving to the old port of JAFFA, an atmospheric town, where Jonah set sail before he was swallowed by the whale. Continue to CAESAREA, an ancient port turned incredible ARCHAEOLOGICAL ZONE. Built by Herod the Great in the 1st century BC, the city was one of the most splendid in ancient Palestine and its capital for more than 600 years. Admire what remains of Herod’s grandiose building works, including the restored 3,500-seat Roman theater, the aqueduct, harbor, and the crumbled moat and towers from the 12th-century CRUSADER FORTRESS. From here, travel to the archaeological site of MEGIDDO, an age-old FORTIFIED TOWN with 25 layers of archaeological findings and one of the world’s most important biblical sites. According to the New Testament, this is where the Battle of Armageddon will take place, the final struggle between good and evil, which will prompt the return of Jesus to defeat the Antichrist and cast Satan into the abyss. Continue to Nazareth to visit the CHURCH OF THE ANNUNCIATION, where the Archangel Gabriel told Mary she would conceive and give birth to Jesus, the Son of God. This evening you may have an opportunity to join a candlelight procession starting from the Church of the Annunciation square. 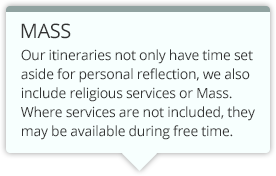 Attend one of the early morning Mass services if you wish, then join today’s included excursion. Bet She’an is one of the best preserved archaeological sites of this region and well worth some time to wander around. Ongoing excavations at this UNESCO World Heritage site revealed time-worn colonnade-style streets, bathhouses, and a theater with perfect acoustics. Today, celebrate Mass in Magdala, home to Mary of Magdalene, then skirt the Sea of Galilee, and enjoy its scenic beauty. Continue to Tabgha and visit the church commemorating the miracle of Jesus feeding 5,000 people with two fish and five loaves. On to CAPERNAUM, home to the Apostles Peter, Andrew, James, John, and Matthew, and to Jesus himself. Here, you’ll see its ANCIENT SYNAGOGUE and the HOUSE OF ST. PETER. Spend some time in the gardens of the MOUNT OF BEATITUDES, where Jesus delivered his famous sermon, and meditate its significance. On the way back to Nazareth, stop in CANA, site of the wedding miracle. Enjoy a spectacular drive through the Jordan Valley. Stop at the QASR EL YAHUD baptismal site where, according to tradition, Jesus was baptized by St. John the Baptist. Continue to Bethlehem, birthplace of Jesus and King David. Visit one of Christianity’s holiest places, the CHURCH OF THE NATIVITY, built over the cave thought to be the spot where Jesus was born. Here, you will have time to pray and attend Mass, if you like. Reach the holy city of Jerusalem in the late afternoon. An intense day of reflection awaits as you set off on a walking tour of Jerusalem’s Old Town. From the MOUNT OF OLIVES, take in memorable views over the city’s domes, walls, and rooftops before strolling in the GARDEN OF GETHSEMANE, where Jesus prayed on the night before his arrest. Your guide will then lead you into the JEWISH QUARTER, pointing out the WESTERN WALL with its prayer notes tucked between the stones, and the Dome of the Rock, the gold-topped mosque on Temple Mount. Walk the famous Via Dolorosa (Way of the Cross), following in Jesus’ footsteps as he bore the cross to Calvary for his crucifixion and burial, where the BASILICA OF THE HOLY SEPULCHRE now stands. Later this afternoon, attend Mass, if you like. Today is free to relax, explore Jerusalem at leisure, revisit some of the most significant places of worship, or join an exciting optional excursion to the Dead Sea, the planet’s lowest point on dry land. Travel through the mountainous Judean Desert and pass the Qumran Caves, where the Dead Sea Scrolls were discovered. 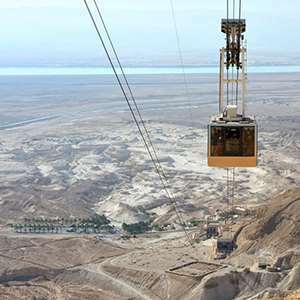 Ride the cable car up to the magnificent Fortress of Masada, perched high on a clifftop plateau above the Dead Sea, where 960 Jewish rebels made their last stand against Roman forces in 73 AD. Later, head for the shores of the Dead Sea, where you’ll have some time to experience the incredible buoyancy in the salt water. Toward the end of the afternoon, return to Jerusalem. Drive to Allenby Bridge, where you cross the border into Jordan and arrive at BETHANY BEYOND THE JORDAN, where Jesus was baptized by John the Baptist. On to MOUNT NEBO, where Moses saw the Promised Land and where he is believed to be buried. Next, travel to ancient Madaba, the “City of Mosaics.” See the spectacular BYZANTINE MOSAICS and the precious 6th-century mosaic map of the Holy Land, and visit ST. GEORGE’S CHURCH. This morning, visit the archaeological site of Petra, a UNESCO World Heritage Site and one of the New 7 Wonders of the World®. Enjoy an unforgettable experience as you walk down the SIQ, the narrow gorge made famous in Indiana Jones and the Last Crusade, and stand in awe in front of the iconic Treasury. This afternoon, travel north to Amman for two overnight stays. Begin your day with a stop in JERASH, which was inhabited as early as 3200 BC. Although the city was impacted by the earthquake of 749 AD, it is the site of the best preserved Greco-Roman ruins in the Middle East. Travel through beautiful pine forests and olive groves before arriving in AJLOUN, where Hadrian stayed during the winter of 129-130 AD. Next on the agenda is the biblical city of ANJARA, where Jesus, his disciples, and the Virgin Mary stopped and rested in a cave as they traveled between Jerusalem and Galilee. Today, the cave is a holy place for pilgrims. A spectacular day trip through the Judean wilderness landscape in the Dead Sea area.